The GS’ six-speed…stood up well enough to the BMW’s eight-speed auto, and felt far more competent in a performance setting than the E-Class’ seven-speed transmission. Upshifts and downshifts felt faster, and better timed (when left in automatic). Shift shock wasn’t an issue either, as mid-corner shifts (we were testing, get off our case) didn’t do much to disrupt the chassis. As we said, the 5-Series will win a straight-line race. 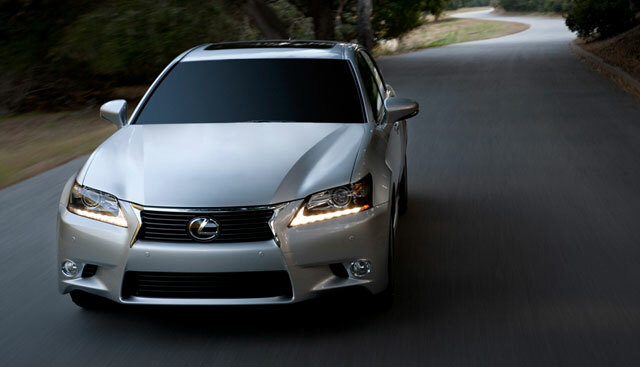 Its turbocharged powerplant just delivers too much torque for the Lexus to really compete. In fact, shown a set of curves, the 5-Series might still win. The thing is, the GS is easier to drive quickly, and for that reason, it would probably be our choice. The GS feels more stable, especially when being pushed hard. At times, the 5-Series felt unruly, liable to step out of line with less provocation than the Lexus. Part of the problem was the nature of power delivery from the turbocharged six-cylinder, as hitting the gas too early on corner exit could cause stability problems. With the 5-Series, A6, and GS all getting significant redesigns, the E350 is now the old car in the range, and it shows. The cabin in the Benz just can’t stand up to the new Lexus. The materials don’t feel that great, and the infotainment systems are feeling at least a generation behind everyone else. As someone that focuses strictly on Lexus, I don’t really have much opportunity tracking competitor vehicles, but from my own recent experience driving the 5-series and E-class against the new GS, I would say Winding Road gives a very accurate assessment — no doubting it now, Lexus has definitely become a player when it comes to performance. essay writing service: that is a great post! i really enjoyed it! so thank you very much!